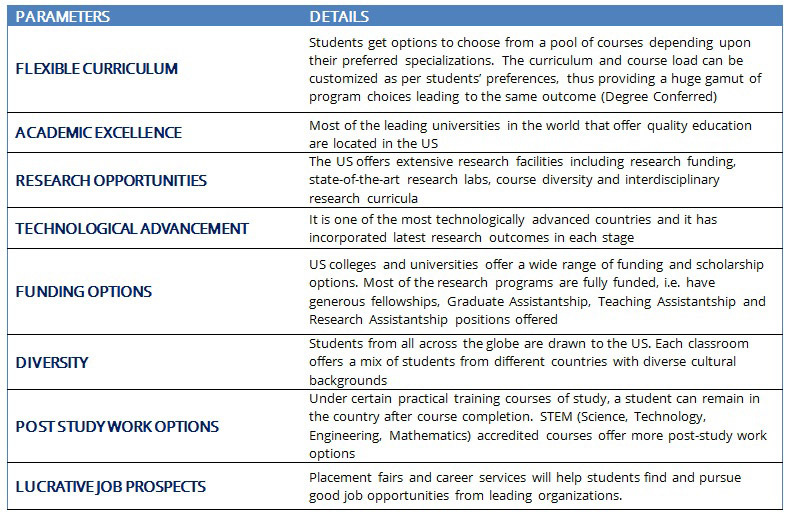 For several decades now, the United States of America (USA) has remained the favourite destination for students aspiring to pursue higher studies abroad. No ranking list is complete without the inclusion of the US Ivy League and other top universities among the top 10. The latest QS World University Rankings 2018 has 31 US universities in its top 100 list with 28 more in the list of top 300, the most for any country considered for ranking. Known for its academic excellence, the US universities/colleges offer the widest variety of courses and specialisations and hands-on practical experience. The USA is a conglomerate of 50 independent states and is the fourth largest country in the world, in terms of land mass and size. With such a big land area, the nation follows multiple time zones and is diverse in terms of population; even the climatic condition of the US varies between its longitudinal and latitudinal borders. Exploring the nation that encompasses natural beauties like the Niagara Falls, the Grand Canyon, and the Rocky Mountains, and man-made wonders like the Golden Gate Bridge and the Statue of Liberty is a dream come true for every visitor. Students enrolling for education in this “Land of Opportunity” are exposed to its deep-rooted history, high-end contributions to the technological and economic world, and inclusive cultural background. The country boasts the largest international student population in the world. Nearly 10,00,000 students choose this federal republic to live and cherish their American Dream. On the whole, about 5% of the student population in the USA comprises international students, and this number is continually growing on a progressive scale.